Janan (Jan) Hayes first joined ACS during her Ph.D. program at Brigham Young University. She had already gotten her B.A. and M.S. in Physical Science Education from Oregon State University and taught high school chemistry at Fortuna CA High School. She came to Sacramento as a faculty member at American River College in 1971 after completion of her Ph.D. in Inorganic-Analytical Chemistry and immediately got involved in the Sacramento ACS Section. She first served on the Education Committee. When asked to run for a section office a few years later, she turned down the chance to run for Secretary, but was interested in the Councilor position that was being vacated. Having been elected (with no opposition) she began 40 years of continuous service on the ACS Council. She represented Sacramento for 37 of those years. Three additional years, she was a By-law councilor as a member of the ACS Board of Directors. 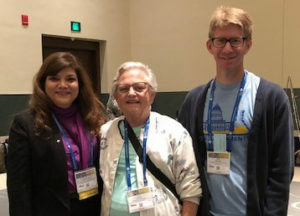 In National ACS service, Jan served on the Meetings and Expositions Committee for 10 years (3 as chair), Committee on Professional Relations (3 years as chair of PROPAC), Women Chemists Committee. In addition, she has been elected to and served on the following Council Elected Committees: Committee on Committees (6 yrs, 3 yrs as Secretary), Nominations and Elections (2 yrs), Council Policy Committee (6 yrs, 2 yrs as Vice-chair). The two projects she has been most proud of are her involvement as one of the 2 original planners/developers of the ACS Fellows program and as founder and continuing chair of the program through the Division of History of Chemistry for documentation of the legacy of Past ACS Presidents. She also has served as Chair of the HIST Division. Professionally, Jan was a faculty member at American River College from 1971 to 1981 primarily teaching quantitative analysis and doing water and waste water analysis. She spent the 1978-79 as a NSF Trainee working at an invitro-diagnostic product producer in the Bay Area. In 1981, she changed “hats” and became a “nasty administrator” as Science Area Dean at Cosumnes River College in Southern Sacramento. In 1991 she moved to Merced to accept a position as Dean of Instruction at Merced College. Later she was promoted to Vice President of Instruction. In 1995 she returned to the real world as Faculty member in the Merced College Science Division. She ended her community college career there, teaching primarily non-majors chemistry and physical science. She feels that her greatest influence during this period was helping future elementary school teachers overcome their fear of Physical Science. During her 16 years in Merced, she maintained membership in the Sacramento Section even though geographically Merced is a part of the California Section. Jan retired from MC in 2005 and moved back to Sacramento. Since then she has “failed at retirement”, as she has been actively involved in research in chemical history, helping to direct science-sturdy tours on three continents, and continuing to work on materials that can be of use to those who are involved in all levels of STEM education. In 2016, she moved to Syracuse, UT, to be closer to her adopted family where she effectively has 3 children, 10 grand-children, and 4+ great-grandchildren. But she is still active as a member of the Sacramento Section and its executive committee as the section historian. Additionally, she is trying to take advantage of opportunities to travel. In 2018, she has been in Ireland and France and will spend Christmas in Germany. Early in 2019, she is already scheduled to visit Australia and New Zealand. This travel is in addition to making all ACS National meetings and several regional meetings. Her other activities include family history (genealogy) and doing cooking demonstrations. One impact of these varied activities is the number of boxes (mainly papers and books) that are still unpacked from her move from Sacramento to Utah almost 2 years ago. She says that the Sacramento ACS Section will always have a special place in her heart for all of the wonderful experiences of the last 47 years.